Since 1997, we've been fortunate to call Gwinnett Commerce Center home. From I-85 South (from Gainesville/North GA), exit 104 - Pleasant Hill Road and turn left onto Pleasant Hill Road. Continue until you cross Breckinridge Blvd/Shackleford Rd. 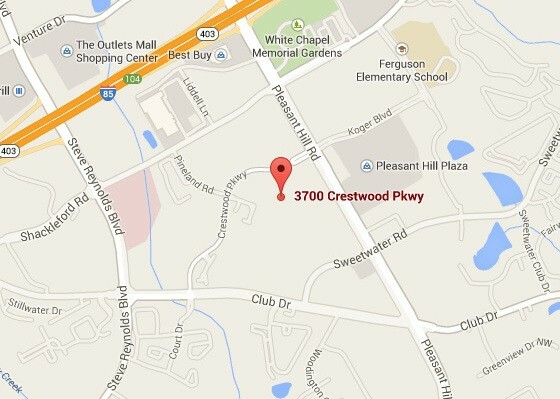 The next intersection is Crestwood Pkwy. Turn right onto Crestwood Pkwy. We are located within the Gwinnett Commerce Center, the large glass office building on the left behind TGI Fridays across the street from the Sonesta Hotel. From I-85 North (from Atlanta), exit 104 - Pleasant Hill Road and turn right onto Pleasant Hill Road. Continue until you cross Breckinridge Blvd/Shackleford Rd. The next intersection is Crestwood Pkwy. Turn right onto Crestwood Pkwy. We are located within the Gwinnett Commerce Center, the large glass office building on the left behind TGI Fridays across the street from the Sonesta Hotel. From the main entrance to the parking lot, visitor parking is to the left (circle the roundabout and take the right off the roundabout after passing the building). Our office is on the main floor. When you walk in, go to the security desk and turn right. Our office is straight down the hall from the security desk, Suite 140.